We understand that going to the dentist can incite fear or worry for some people. Even the thought of going to the dentist may be enough to cause anxiety, thus preventing you from even making an appointment. If this scenario sounds familiar, then sedation dentistry may be for you. Sedation dentistry is a way of keeping you calm and relaxed through the use of sedatives during dental procedures. These sedatives may include tranquilizers, nitrous oxide and anti-anxiety medications. In some clinics it is common to administer sedatives via the intravenous or IV method. This involves injecting the sedative directly into the blood vessels of either the arm or hand. Although this method is very effective, even the thought of a needle in the arm or hand can be stressful for some people. Medical advancements have helped create alternatives for administering sedatives without using injections. Today, patients can choose oral administration for sedation – gone are the needles! Indeed, oral sedation paves the way for a painless, relaxing dental visit. Deciding if oral sedation is right for you involves addressing many factors before reaching a decision. We can take you through every step of the procedure – from the day before treatment to the moment you head back home. Through pre-treatment consultation, we will check your dental history, your anxiety levels and other health factors. Taking sedatives may pose risks; therefore, it is very important for us to know about medical conditions that may be adversely affected by sedation medications. After addressing all of these concerns, you and your dentist will decide what type of sedative and dosage will be best suited for your needs. Because it is unsafe for a sedated individual to operate a motor vehicle, you will require assistance to and from our office from a family member or friend on the day of your appointment. Also, since the effects of sedation may vary from patient to patient, it is prudent to have someone on hand afterwards. We recommend having someone take care of you for at least 12 hours following your sedation visit, just to ensure that the sedative is wearing off properly and that your are in a safe environment. Sedation dentistry offers many benefits. Lengthy procedures (appointments that take more than an hour to perform) may seem to last for only a few minutes for the patient under sedation. Furthermore, you may be able to undergo more treatment per visit while sedated, thus reducing the total number of visits required. 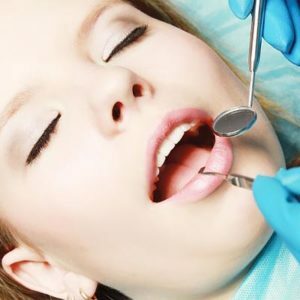 More importantly, sedation dentistry allows the patient to regain confidence in themselves because the anxieties that would normally be present are kept under control throughout the painless visit. Through the development of this confidence, we have actually had patients return for visits without requiring any sedation at all! Sedation Dentistry is Safe: You will not be unconscious, but will merely be in a deeply relaxed state. No intravenous tubes or needles are required. Sedation Dentistry is Pain-Free: You will feel no pain while in the dental chair, and you will have little to no memory of the experience. Sedation Dentistry is Flexible: Depending on the treatment you require and the level of sedation achieved, sedation dentistry can help you remain relaxed for two to six hours. Complex Dental Treatments can be Completed in Just One Visit: You can have crowns or bridges replaced, veneers cemented, numerous fillings done, a professional cleaning completed with our hygienist, or numerous teeth extracted; all while you remain comfortably relaxed. Taking care of your teeth need not be a painful or stressful experience. So contact us and find out how oral sedation may work for you. Call Us at (403) 261-8855 to book your Sedation Dentistry appointment today!